Honestly is a bit difficult for me to do Tuckman Assessment to a team which I only met virtually, but I’ll do my best to do it with my limited resources of knowledge to other team member. 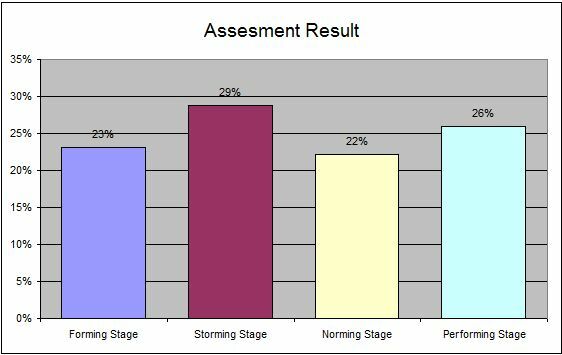 The reason we need to do this assessment is to define on what stage are our team right now. This is important because by knowing on what stage we are, we can then decide what kind of leadership that we currently need. Decisions don’t come easily within group. Team members vie for position as they attempt to establish themselves in relation to other team members and the leader, who might receive challenges from team members. Clarity of purpose increases but plenty of uncertainties persist. Compromises may be required to enable progress. Based on above types, I think the suitable leadership style to be use at this storming stage is People-oriented leadership (relations-oriented leadership) and Democratic leadership (participative leadership). The reason is because the entire team members currently still need a lot of support from their leader, both Project and Program Manager. The leader is in an important roles to organized, support and develops the team member while in the other hand they also need to let team members to contribute on the decision making process. It’s a though phase and required a big responsibility from all team members to do their roles in the team. But I’m sure if all of us can be a good team member, stay focused on our goals and support each other, we can easily manage this. http://www.businessballs.com/tuckmanformingstormingnormingperforming.htm. Last access on 24 March 2011.
 http://www.mindtools.com/pages/article/newLDR_84.htmhttp://www.mindtools.com/pages/article/newLDR_84.htm. Last Access 24 March 2011. This entry was posted in Nurul Zakiya, Week #1, Weekly Submission. Bookmark the permalink. We recognize and appreciate your active participation in the team, especially considering you missed the kick off session. From this point forward, according to the plan, this posting should be done on Sunday or Monday, early in the week, freeing up the rest of the week to work on papers (given yours is done, the expectations are that you will mentor the team, much along the same lines as I mentored you with your paper) Pay back time!! Check with Bu Lilly to see what the W2 blog posting topic might be. Also, as you are the project manager for the paper project, the project controls team will be expecting that you track and report on the progress of everyone’s paper. That is something you need to really know and understand to pass your CCC/E Exam. Keep up the good work and look forward to you being an active leader, as you have the lessons learned from your previous class.